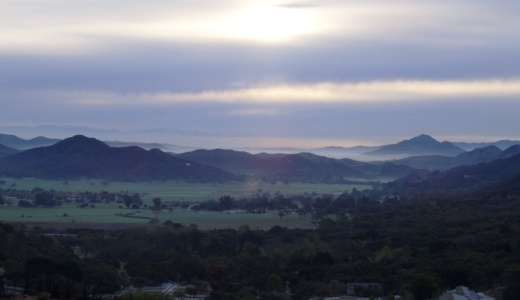 Located on the western edge of the Santa Monica Mountains National Recreation Area, Rancho Sierra Vista/Satwiwa is accessible in Newbury Park at the intersection of Lynn Road and Via Goleta. This area spans from Potrero Road on the north and connects to Point Mugu State Park on the south. Ranching in the area dates back to the early 1800s, when Spanish soldiers were granted 48,672 acres of land, "Rancho El Conejo," which through the years was subdivided and sold to other landowners. One of these ranchers was Carl Beal, who in 1937 named the area Rancho Sierra Vista "Mountain View Ranch." The last private landowner in the area was Richard Danielson, whose family farmed and ranched the area for 32 years. Danielson donated 5,585 acres of the ranch to the State of California, which became part of Point Mugu State Park, and sold 850 acres, including the horse ranch, to the National Park Service in 1980. Sign at Danielson Monument accessible via Danielson Road/Old Boney Trail. The Satwiwa Native American Indian Natural Area is a bike/horse free area within Rancho Sierra Vista/Satwiwa of roughly 60 acres. Located on the northwest corner of this area, just a short walk from visitor parking, is the Satwiwa Native American Culture Center. The Center is staffed from 9 am to 5 pm most weekends with a park ranger and sometimes Native American guest hosts. It is a small facility with a variety of educational Chumash items. There are frequent workshops and programs hosted by the National Park Service at the Center that are highlighted here on CVG and on the NPS Satwiwa website at www.nps.gov/samo/planyourvisit/rsvsatwiwa.htm. The area is a popular destination for hikers with a variety of well maintained trails. Note, however, that bicycles and horses are not allowed in the "Satwiwa Natural Area" section (see map below). Map excerpt courtesy of National Park Service. The Satwiwa Loop Trail is an easy, 2 mile trail that starts at the Culture Center through grasslands, past the old windmill and back around, with several extensions for those looking to do a little more. There's the Lower Loop Trail and the Upper Loop Trail that is a bit of a zig-zaggy trail with wooden footings placed by volunteers to help hikers navigate. The Upper Loop Trail runs past the "Old Windmill" pictured below. Satwiwa Lower Loop sign at intersection of Danielson Road trail. The old windmill at the northeast corner of the Satwiwa Loop Trail (Upper Loop). (Windmill was knocked down by high winds in December 2016 and is still down as of September 2018). You can also park at the Wendy and Potrero trailhead and walk to the Culture Center via the Wendy Trail, about a mile each way. It is pretty dry in here most of the year but after the winter/spring rains, the green stages a comeback. Another trail to explore is the 1 mile Ranch Overlook Trail that takes you from just west of the Satwiwa Native American Indian Culture Center, up a hill (where you can indeed look down toward the old ranch area, parking area and restrooms) to the main entrance and to the Palomino Trail in the Rancho Potrero Open Space. One of my favorite trails in Rancho Sierra Vista/Satwiwa is the Hidden Valley Overlook Trail. This challenging, fairly steep trail branches off from the Satwiwa Loop Trail on the southeast, past the bench at the Upper Sycamore Canyon Overlook, via the Boney Mountain Trail/Danielson Road. The popular bench at Upper Sycamore Canyon Overlook. Photo taken April 4, 2014, approximately 11 months after the devasting Springs Fire of 2013. Roughly 700 feet past the Upper Sycamore Canyon bench is a juncture where you can either veer right into Point Mugu State Park and the Boney Mountain Wilderness, where you can walk down, over a stream (or a dry stream bed as the case may be), towards the popular "waterfall" (which in recent years has been not much more than a trickle) and the Danielson Monument. CLICK HERE for details. If you veer left at the juncture, you'll see the Hidden Valley Overlook trail sign. The trail is steep and rocky and reaches an end point in about half a mile. If you are up to the challenge, you will be rewarded with sweeping views of Newbury Park, the Channel Islands, Sycamore Canyon and Boney Mountain. At the end of the trail is the Hidden Valley overlook, where you will be able to peek into the not-so-hidden-anymore Hidden Valley and its peaceful ranches. As a final reward for your effort, it's all downhill the way back. Be sure to wear solid hiking shoes as the trails are a bit technical. Peek at Hidden Valley at the end of the Hidden Valley Overlook Trail. To learn more, visit the Anthony C. Beilenson Visitor Center at 26876 Mulholland Highway, Calabasas or visit www.nps.gov/samo or call 805.370.2301. Dogs are allowed in Rancho Sierra Vista/Satwiwa as long as they are on a leash no longer than 6 feet. But please, do pick up after your pet. Dogs are not allowed in the Point Mugu State Park / Boney Mountain Wilderness back country trails, though they are allowed on paved roads, such as the Big Sycamore Canyon Trail road.